The Club held its first National rally in 1977 at Lydiard Park, near Swindon , so 2009 saw the 33rd running of this event. Over the years the Club has always tried to adapt to different conditions and to also vary the event to ensure that the maximum number of Jawa / CZ owners can enjoy it. As I’m sure you can imagine this can be a delicate balancing act, as every attendee has differing requirements. From very basic beginnings, what has emerged is an event that needs to offer good value for money, has good camping facilities with preferably full site catering and bar capabilities. So over the years, organisers have used a variety of locations with by far the most successful being various Rugby Club sites. Traditionally site events using our bikes took place (e.g. Obstacle Course; Slow Race; etc), but due to ‘Health & Safety’ spoilsports, our Club ‘Public Liability Insurance’ has now restricted what can be done. This has placed additional difficulties on organisers to try to provide a rally that has alternative events / attractions to keep rally attendees entertained. The 2008 event saw us at the Midland Heritage Railway Centre, where we had full access to the heritage steam railway facilities and museum and, were able to ride the trains as often as we wished. 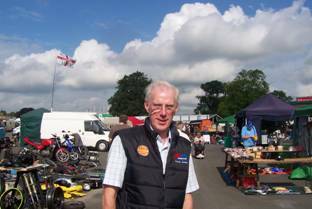 Most commented that they liked the rally being at a site that offered alternative attractions, so for this year our National Secretary, Peter Edwards looked at whether we might be able to tag our event onto the VJMC Uttoxeter Motorcycle Show. This was greatly assisted by our Club’s Scottish representative (George Beer) being the show’s manager. Show Manager - club member, George Beer. The show itself is actually held at the Uttoxeter horse race course and, with up to 80 other motorcycle clubs in attendance, a host of club display stands and many accessory and ‘auto-jumblers’, there was certainly enough other things happening to keep most occupied. We were allocated a camping site in a very advantageous position that also happened to be an area that was well drained. This proved to be crucial as the set up on Friday saw several hours of torrential rain. Although our spot was OK some of the other clubs were not so lucky. As many who traditionally attend our rallies don’t bother to pre-book, it was necessary to have some permanent presence adjacent to the entrance to the racecourse so that these people could officially be booked in. This was manned throughout the event by Peter and Pat Edwards, who due to the booking-in location could not actually be available at the camping area. This was a great shame, but they are both to be thanked for the time and effort they put into manning the check-in point. Like last year we were pleased that five of our German friends had taken the trouble to travel all the way to the event. They really are a great bunch of lads and their Jawa / CZ’s are all in really excellent condition. We all hope they will continue to join in with us at future events. 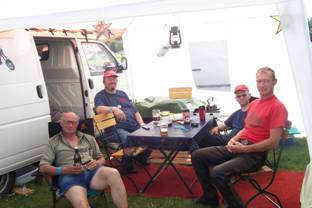 Four of our German Friends under their gazebo. The Friday evening saw more people arriving and setting up camp, and the site soon became quite full. Unfortunately even though we had an allocated area marked out for our sole use, there were some people from other clubs or dealers who pitched their tents and parked their vans in our area. This did cause a few problems as it made access (especially with a sidecar) at times difficult. Both Friday and Saturday saw some music within one of the bar areas, although I have to say that it wasn’t to everyone’s taste. It also saw many walking the short distance into Uttoxeter itself and frequenting some of the bars there (it seems the food and drink were cheaper!). Despite the day being warm, Friday night was cool and so it was a relief when Saturday dawned sunny and warm. Tents can be cold at night, but as soon as the sun comes out, they heat up very quickly! The show opened to the general public at 09:30, and there was soon a stream of people entering. Before it got too crowded it was a good time to look around the various dealers and accessory stands to see what goodies could be purchased cheaply. 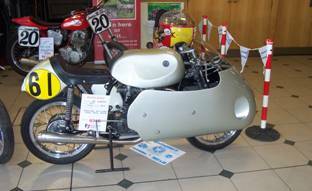 Within the Premier Hall the Club had also put on a display of interesting Jawa/CZ race machines. 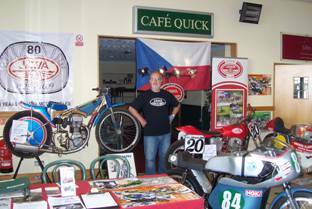 On display were John Blackburn’s Jawa Speedway and Short Track bikes; Mick Wainwright’s Jawa 500cc & 350cc Road Race machines together with a 250cc CZ Road Racer, and finally a very interesting ‘Walter’ Road Racer. The Jawa 500cc Road Racer (on the Saturday) and the Walter (on the Sunday) also took part in a parade of bikes on their respective day when their engines were fired up. These parades attracted a lot of interest. Chairman John Blackburn on Club Display. CZ ‘Walter’ Road Race Machine. 10:00 on the Saturday also saw Ian Bridges lead a ‘Run-Out’ of 16 bikes into the beautiful countryside, where after a run through small villages and hamlets we ended up at an old Mill site. Here next to the stream we had a refreshment break before heading back to the site. Ian took us on many unclassified roads including some with grass growing up the middle, across fields of cows, with gates to also open and close. Quite an interesting ride. The rest of Saturday afternoon was spent by most just relaxing on site and chatting, or looking around the show’s exhibitions. Early evening saw John Blackburn doing the award ceremony, but as this was being done outside, there was a short delay as a heavy rain shower temporarily halted the proceedings. Saturday evening was again spent by many in the cafés and bars on site, while others went into Uttoxeter and others just chatted on site. Most went to bed quite late! 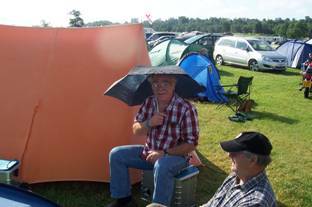 Mally Morgan with his sun umbrella! Saturday night was a lot warmer, but Sunday saw some of the early risers packing away and making a start home. The remainder took Sunday morning at a leisurely pace, with again some doing a tour of the various show stands and displays. Combining our National Rally with a show was certainly something different, and Peter is to be congratulated for making the actual arrangements. Being as there were so many other attractions to look at, the rally did have a different feel to past ones, and while it was very enjoyable, there were also some usual features missing. It would be interesting to have feedback from others who attended, as it will help the Club’s committee to plan future events. Special thanks must go to all the National Club Committee members involved in organising the event and the excellent Club display. I’ve never been to this type of show before so having the National Rally at Uttoxeter Classic Bike Show seemed right up my street. I certainly had an interesting weekend and covered 562 miles in all. First impression? Clever organisation for starters! For a show run by vintage Japanese bike enthusiasts, Pete Edwards and the gang certainly did well at promoting Jawa CZ. The first thing all weekend pass holders saw on arrival was a caravan with Pete’s gammy leg thrust out of the door and a huge banner announcing the Jawa CZ Owners Club (attached to the fence – not Pete’s leg). Once past security, folk were then confronted by another prominent Jawa CZ sign on the corner of our rally plot. To cap it all, our club stand was positioned just inside the main doors of the largest indoor gallery. Well done to all those involved. It was great to go round looking at the exhibits on Friday evening and take a few photographs without crowds of people getting in the shot as well as my thumb. Saturday had lots of atmosphere and the sun shone throughout the main show timetable. I hadn’t a clue what most of the auto jumble was for but still managed to buy a couple of bits that weren’t food related. Another first, I think the 10am ride out started on time! I had a reflective waistcoat stretched over my chubby body so ride leader, Ian Bridges, asked me to ride at the rear so that he had a better chance of seeing if we were all together. That meant I had a good view of all the bikes snaking round lanes, up hill and down dale. It made me wish I had Carol with me to video from her pillion seat. The Alton Towers car queue stretched for miles along narrow country roads. With hardly any oncoming traffic, having a bike was a definite advantage. Seeing our convoy stream past must have made a few car drivers wish they had come on two wheels. I expect our 4 German visitors enjoyed riding back on the “proper” side of the road for a few miles (kilometres). Most bikers carry a bottle opener but Ian carried a gate opener as well. She galloped back and forth across the Peak District National Park with legs like a Gazelle, opening and shutting each gate we came across. Before our 20 minute refreshment break at an idyllic spot, called Wetton Mill, we passed through a long, tall, dark tunnel that also contained a few ramblers. Some were startled by the noise from at least 15 bikes in the tunnel with them and had fingers in their ears. By the time all the elderly strokers had passed through, they were trying to pinch their noses as well! After the break we had to negotiate a river. Ian rode through the raging torrent rather than carry his bike across on his back so we all followed suit. No one drowned – but then I am prone to slight exaggeration. The scenery was breathtaking, the riding fun, the weather perfect and the company……interesting as usual. After wandering round the showground I walked into Uttoxeter town centre and noticed that motorcycles do not get free parking. Having been caught out in the past, I can often be found squinting at the small print in car parks. Perhaps it is time for someone to invent a simple (cheap) way of securing parking tickets to a bike in the wind, rain and light-fingered environment. Ideas anyone? I didn’t stick around for the Sunday session but enjoyed the rally immensely. My grateful thanks to everyone who had a part in putting it on for us all.